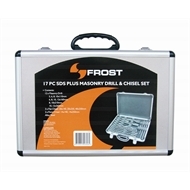 The 17 Piece Combination SDS Masonry Drill Bit and Chisel Set includes 4 masonry drill bits, 3 flat chisels and 2 pointed chisels in an aluminium case for easy, safe storage and transportation. Masonry drill bits are general purpose bits designed for machine and hand held drilling into metal, wood and plastic. They come in 5, 6, 8, 10 x 10mm, 6,8,10,12 x 160mm, 8,10 x 210mm and 10,12 x 260mm sizes. The flat chisels come in 20 x 140mm, 20 x 250mm, 14 x 250mm sizes and the pointed chisels come in 14 x 140mm and 14 x 250mm sizes.